On this excursion you get to visit the iguanas, cruise along our cays , snorkel our gorgeous reef and collect shells on Fort George and Pine Cay. This trip is great for the whole family. Let our first-class staff sweep you away to enjoy the breath taking beauty of Turks & Caicos with a 100% customized charter where you can enjoy snorkeling in beautiful azul waters, island hoping or ocean cruising just to list a few. Cruise along award winning Gracebay beach and the northern shore, where you will watch the sunset. This is very relaxing and a great way to end your day. For those who want to take their time alone and have a quiet day on a secluded beach, this trip is perfect for you. Chairs and an umbrella with rum punch and picnic basket will be provided for you. 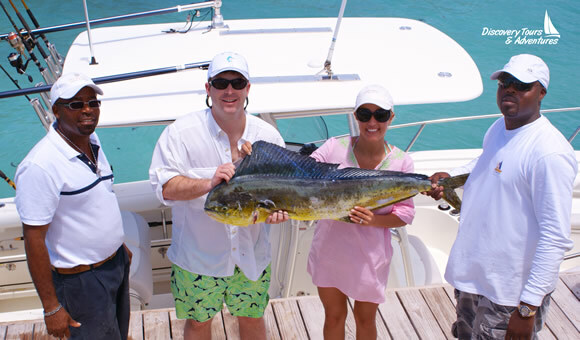 Enjoy some of the best deep sea fishing here in the Turks and Caicos Islands. An experienced crew will guide you to the best fishing spots. Boat fleet includes a: 36ft Boston Whaler Outrage or 28ft Boston Whaler Outrage. The trolling method of fishing is used during this experience. This is one of the most exciting and easiest way to catch a fish , we fish along the reef where you can catch a wide variety of fishes. Such as groupers and snappers. Bottom fishing is perfect for the first-time fisherman, kids and families, as well as expert anglers who love the thrill of fighting fish such as Groupers, snappers, grunts, and turbots. Bottom fishing has a higher catch rate so if you’re after more action, then this is the perfect style for you. Turks and Caicos has over 40 miles of shallow flats and is perhaps the greatest bonefishing waters in the world. With over 40 years of combined experience, our guides have developed a “sixth sense” in stalking bonefish and anticipating their daily routine in all conditions. Our team demonstrates a positive and encouraging attitude, while creating a happy and safe environment full of learning.